For travellers and shift workers, fatigue can be a serious problem. Love is the CTO of Toronto-based Syncadian, a software company that’s developing an app to help its users sleep better and shift their circadian rhythms before long trips or late shifts. The startup comes out of research conducted by Defence Research and Development Canada, the Canadian military’s scientific research agency, where Love did a postdoctoral fellowship. “The Canadian Forces have a number of issues with sleep an fatigue,” Love says, given that aircrews, sailors and infantry have soldiers working 24 hours a day. He says the problem is particularly severe in the airforce and navy, where not only a soldiers working shifts in dangerous environments but where they’re also responsible for the safety of their colleagues and expensive pieces of military equipment. In his work with the military, the goal was to “try an figure out where fatigue is the most prevalent and where it can do the most damage,” Love says. It’s a problem the Forces have been working on for quite some time. Love says he “worked on a seven-year study on circadian rhythms” which looked at soldiers. That’s particularly important for someone looking to change when they’re sleeping. “Take the average business traveller or air crew, they’re subjecting themselves to massive amounts of jet lag,” Love says, others, like “shift workers or an individual doing a watch in the navy,” face similar circumstances – even though they’re not changing time zones. “They could be working in the cognitive toilet,” Love says. Melatonin is a naturally-produced hormone that helps regulate sleep. Love describes it as a “zeitgeber” a term that applies to external and environmental cues that synchronize people’s sleep patterns with the natural world’s day – night cycle. “It’s a very potent zeitgeber,” he says. 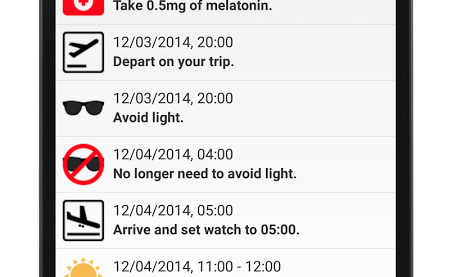 “Light is a major zeitgeber” as well, so the app also encourages use of a sleep mask at certain times. For him, that’s a big part of the reason why its so important for him that the apps his company makes have a strong scientific basis. Right now the jet lag app is a free download and Syncadian is still trying to figure out exactly how it plans to charge users. The startup recently joint the University of Toronto’s incubator UTEST, which has given it “the ability to build up our programs and software,” Love says.